1	Cut the chicken into bitesize chunks and put into a large bowl with the bay leaves. Thickly slice 1 lime and cut 1 onion into wedges, then separate the layers. Add to the bowl with the juice of the second lime, the oil and seasoning. Mix well. Quarter the tomatoes and finely chop the second red onion. Mix in a separate bowl with the chipotle Tabasco and seasoning. 2	Preheat the barbecue (or grill/griddle). If using bamboo skewers, soak 4 in cold water for half an hour. Thread the chicken, bay leaves, onions and lime slices onto the skewers. Cook for 10-12 minutes, turning often, until evenly cooked, the juices run clear and there is no pink meat. 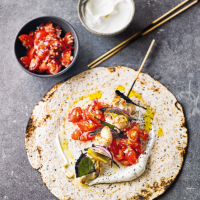 the skewers in the wraps with a little tomato salsa and yogurt.